Home Food How to Enjoy a Safe, Raw 3-Day Juice Fast! The Optimum Health Institute, where I used to teach raw food classes, recommends a juice fast 3 days every month. It’s also a good idea to do a 10 day fast once or twice a year. There are 3 types of juice fast programs. Please remember before starting any new health program consult your own health care professional. 3 days helps you get rid of toxins and cleanses the blood. 5 days starts healing and rebuilding the immune system. 10 days helps prevent disease by reversing damage caused by exposure to acidic toxins in cooked & processed foods, pesticide residues, prescription drug residues in the waters, volatile organic chemicals and other acidic toxins. I recommend a juice fas (or juice “feast” if you prefer) because fasting on water alone isn’t recommended for most people. This releases the toxins too quickly and can cause unpleasant detoxification symptoms (feels like the flu). A juice fast for more than 3 days should only be done under the supervision of a your health care professional unless you have done this before and know what you are doing. If you have diabetes, hypoglycemia, or another chronic health problem, even short fasts should be supervised. Pregnant or lactating women should never fast. Remember. it took years or decades to break down your body, so it will take time to build it back up. Remember, to take your time and have compassion for yourself during this healing, rebuilding process. A raw, organic juice diet will help prevent the most uncomfortable symptoms of detoxification since it lets your body excrete built-up toxins more slowly than a water fast. It also improves healing by supplying vitamins, minerals and enzymes. A juice fast fast also helps you get more accustomed to the taste of raw vegetables so that it’s easier to continue a raw food lifestyle afterwards. I recommend taking your time to enter into and leave any fast over 1 day. A 3-day fast should have at least a week of preparation going into and ending the fast. This prepares your body by getting rid of some of the toxins before your actual fast so once you start fasting it is less of a shock to your system. If you have more experience or a very organic and raw diet, you camn skin this step or shorten it. Start by slowly eliminating all sugar, stimulants (coffee, cigarettes and alcohol), meats, fish and dairy. By the time you are ready to start your fast your diet should be just raw, organic fruits, veggies, seeds and nuts. Also try to avoid gluten (found in grains like wheat). For a few days before your fast, try blending all your food in a food processor or popwerful blender (I love my Blendtec Home blender). This prepares your digestive system by reducing the digestive workload, slowing it down and getting it ready for a lack of food during the actual fast. You can find tons of smoothie recipes online – especially green smoothies. Remember the maxim, “chew your liquids and drink your solids.” Digestion starts in the mouth, so chew your juices slowly – don’t just gulp them down. During a juice fast drink at least ten 8-oz glasses of water, juices and herbal teas daily. Use only purified water, preferably alkaline mineral water made in a quality water ionizer (I recommend Life Ionizers because of their excellent quality, customer service and Lifetime Warranty). I recommend juicing only vegetables. Fruits have too much sugar and are too acidic for most people to use during a juice fast. In fact, most people probably have some kind of sugar metabolism issue and don’t know it, so avoid all sugars even after your fast until your are sure your body has rehabilitated its ability to properly metabolize them. Lemon juice for a cleansing drink or master cleanse is an exception. Also avoid the sweet vegetables like carrot and beets, since they are also loaded with sugar, especially when juiced. If you just cannot take the taste of a pure green juice, then add a carrot or two. Some people add an apple, but remember that it is best not to combine fruits and vegetables. This is “food combining” principle, since fruits and veggies require different enzymes for optimum digestion and absorption, which is particularly important when fasting. Dilute all juices with water, at least half water and half juice. Try to use only fresh-made organic juices. If you don’t own a juicer, then get your juice at a local health food store or juice bar. Do not use canned, processed, bottled or pasteurized juices, even if they say “healthy” or “natural” on the label – they are not! The best quality juice comes from a slow speed, masticating juicer (the best bang for the buck is the Samson Juicer, though I use the awesome GreenStar Elite myself). Try to avoid a high-speed centrifugal juicer since ti will increase oxidation in the juice and lower the juice quality. However, any FRESH juice is better than no juice, so if that is all you have access to, then go for it! In fact, if you cannot afford a juicer, you can often find a decent centrifugal juicer in a thrift shop or on eBay for under $50.00. Fresh lemon juice -add juice of 1 lemon to a cup of warm water. 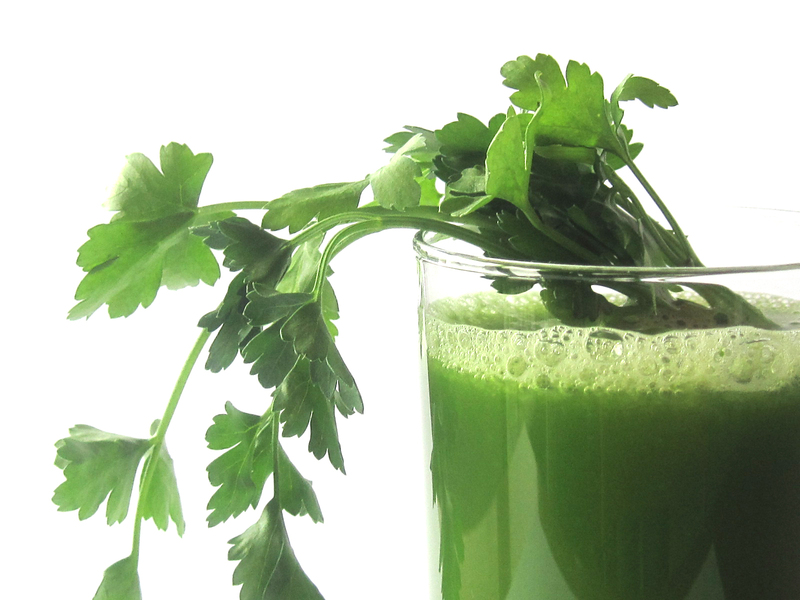 Healing Juice Recipe: 1 or 2 carrots, 3-4 kale leaves, 2 stalks celery, ¼ pound spinach, ½ head of cabbage, ¼ bunch of parsley, ¼ of an onion and ½ clove of garlic or 1/4″ piece of ginger root. If you don’t have a juicer, place some vegetables (including onion and garlic) in pure water and boil them for 30 minutes, adding no seasonings, for severla minutes until all the vegetables are mushy. Drink the broth after cooling and straining. Continue your normal daily routine, including mild exercise. Avoid strenuous activity. Planning your fast over a weekend makes it easier. Remember to get plenty of rest since your body needs to channel all its energy into healing, plus, it isn’t getting any energy from food. 5 cups of organic baby greens, spinach, kale, parsley or other dark green leafy vegetable. Return to blending raw fruits, vegetables, seeds and soked/sprouted nuts for 3 days after finishing the fast. Jumping right back into cooked, processed foods right after a fast is actually worse than not fasting at all – it is a huge shock to your body! Enemas during a juice fast are an absolute must to take some of the pressure off your colon, kidneys and liver, which are processing all the toxins your body is releasing during your fast. In addition, regular bowel movements are disrupted because of lack of fiber. The toxic waste discharged into the intestine can just sit there fermenting, and even can be reabsorbed into the bloodstream causing a cleansing crisis. Sometimes you’ll actually feel pain in your kidney area. Enemas assist the body in its cleansing and detoxifying effort by helping to flush toxic wastes from the alimentary canal. Enemas should be taken at least once, preferably twice a day. (Upon rising and before going to bed.) One pint to one quart of lukewarm distilled water is sufficient. If possible, you can replace daily enemas with 2 or 3 (per week) professional colonics from a licensed colonic therapist. Slowly reintroduce solid foods back into your diet. Start with raw fruits, vegetables, seeds and nuts. Then add easy-to-digest and hypoallergenic foods. If you think you have anyfood sensitivities or allergies, this is the best time to test them. One at a time, slowly reintroduce wheat, dairy, eggs, soy, sugar and nightshade (tomatoes, etc.) to your diet. Eat day consume 2 to 3 servings of one suspect food. Note any reactions. Wait for a day and then on the third day, try another food. Repeat until you’ve test all the suspected foods. If with this safe 3-Day Fast, some discomfort is normal as your body releases toxins. You may experience fatigue, body odor, dry skin, scaly skin, skin eruptions, headaches, dizziness, irritability, anxiety, confusion, nausea, coughing, diarrhea, dark urine, dark and foul-smelling stools, body aches, insomnia, mucus discharge and/or visual or hearing problems. These symptoms pass fairly quickly. Once they do, be prepared to feel terrific! You are entering on a wonderful journey – so please take the time to educate yourself about what you are doing. You are starting on a wonderful new life, but doing it properly takes time to learn. Have compassion for yourself and your process – take time to let go of old habits and food addictions. If you find yourself feeling weak or a little flu-like, you may be detoxing, which is normal. You can slow down until you adapt more or take the time to learn more about cleansing to actually speed up the process. Good luck and happy fasting.